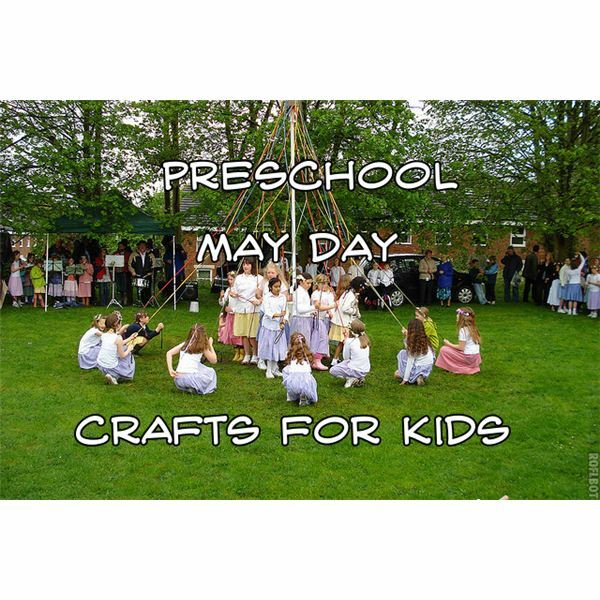 In finding the right May Day crafts, preschool teachers should keep in mind young children’s preoccupation with representative play. Although making a full-sized maypole may be difficult for children to do, they should be able to make a miniature one for their dolls or small figurines to play with quite easily. Provide each student with a paper towel roll, various craft supplies and assorted ribbons. Encourage students to decorate the outsides of their paper towel rolls with the craft supplies, by gluing sequins, cutout shapes or short pieces of ribbon to them. Have them choose several long strands of ribbon and put a small dot of glue on the end of each one. They can then press the glue dots to the top of the paper towel roll’s interior and leave it to dry. When it is done, children can help small dolls or figurines dance around the maypole, holding the ribbons. You may want to anchor the maypoles before children play with them. To do this, simply cut several slits around the bottom of the maypole and fold out the resulting pieces to form a flat base. Glue the pieces to a piece of cardboard to anchor the maypole. Everyone loves a May Day basket, especially preschool children who can fill it with wildflowers! To help children make their own, provide them with the bottom of a shoebox to decorate. If possible, let students use real paint to cover up any lettering or logos on the outside of the shoebox. Students may wish to paint flowers or maypoles on the outsides of their baskets, as well. Help them punch holes one the sides of the shoeboxes and tie long pieces of yarn through each hole to make a handle. Go outside with children and encourage them to collect various wildflowers or other natural objects, such as leaves and grass. Each child can place the collected objects into a small bag (or into a homemade May Day basket). Tape a square of contact paper to each child’s desk, sticky-side up. Children should take the flowers they have collected and arrange them on the contact paper, leaving some spaces between flowers. Help them cover the flowers with another layer of contact paper, sticky-side down. Hang their light catchers on a large window so that the light can shine through the flowers. Most preschoolers have already made tissue paper flowers, and using pre-cut flowers insults their creativity. Instead, give them the tools they need to make their own unique flowers. Cut out circles in various sizes from stacks of construction paper, making sure to include as many colors as possible. Then show children how to select several circles that are the same size to form the petals of a flower, and one larger or smaller circle to form the center of the flower. Children can then glue these to a piece of paper, the outside of a basket, a miniature maypole or even a light catcher. These May Day crafts, preschool teachers agree, are the perfect ideas for preschool students everywhere.